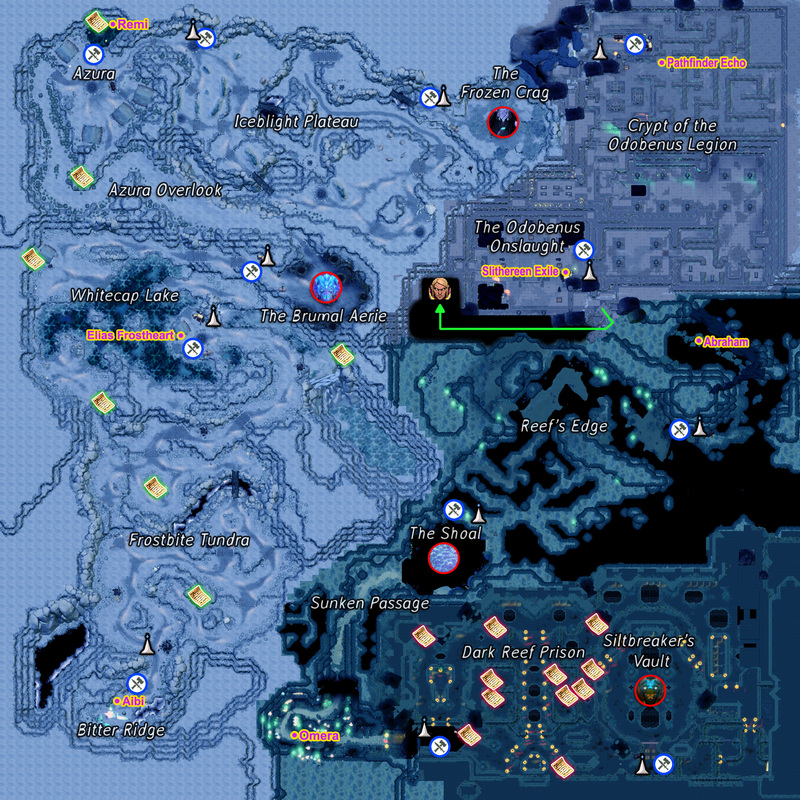 Players must progress through separate zones to complete the campaign. Each zone has three difficulty tiers, represented by three stars. A star ranking is given out at the end of each zone depending on certain criteria met. Players can pass through a zone without earning any stars. Click on a zone's name for full information regarding units, objects, drop rates and more. Discovered in an attempt to find easier passage down the mountain, Bitter Ridge offers nowhere to go but up. While visited by the occasional bold trader, this tundra's deadly inhabitants ensure continued backwater status. Find Whitecap Lake in under 9:00 / 7:30 / 4:00. Eliminate at least 10 / 20 / 30 Frostbitten Shamans. Your team must have no more than 5 / 2 / 0 deaths. Frostbitten Shamans cast spells that are difficult to see against the map background. Green waves of smoke should be avoided as soon as the sound of the action is heard. The projectile moves in a straight line, and is roughly as fast as a hero with Boots of Speed. Do not go out of your way to fight more groups, as they respawn endlessly. 3star: Kill shaman along the way. When you meet crossroad, kill 2 camps (at least 1 camp) on bottom and then back to the top again (because the 3rd camps is too far away). When you only need few more shaman, send 1 player to straight run checkpoint while others kill the rest of shaman. after this you can farm the zone 1 again. The Whitecap fish camp is merely an outpost of a larger settlement found farther up the mountain. Save at least 10 / 20 / 30 penguins. Eliminate at least 1 / 2 / 3 Alpine Growlers. You team must have no more than 5 / 2 / 0 deaths. There is no time limit for this zone. Take your time and do not rush. All three Growler types have Fury Swipes, causing them to do more damage on a single player over time. Swap between different players to tank big groups and reduce the stack damage..
Ogre Seals are hidden under the ice, and will jump out when players are nearby. Try to stick together, don't go searching for treasures alone. Paw of Lucius can kill Ogre Seals quickly when they start to jump. Protect the teammate carrying the penguin. Always open Treasure Boxes before you save penguins, Sunstrikes and Land Mines kill penguins once you have activated the penguins. Boss Growlers would use a spell similar to Berserker's Call. The spell has a red visual indicator around the boss Growlers. This spell is lethal as this gives the smaller Growlers to focus on one ally hero, accumulating Fury Swipes. Two ways to overcome the Berserker's Call, either by picking mob clearing heroes like Gyrocopter, or by running when the boss Growlers cast the spell, and fighting them after that. no time limit here and all of your enemies have huge damage, so sometimes you need to restore your mana and hp again. 1. go down and save 4 penguins in the east. 2. in the west you will see 4 penguins there. clear the area from spawning seals. after that save that 4 penguins. Tiny's Toss can interrupt an Ogre Seal's jump if timed right. A notification sound will be played right when the zone creep respawn. With this information, you can wait for the seals and growler to respawn, killing them and rescue the penguin. The respawn interval is random at approximate 70 ~ 90 seconds. Usually a waypoint between Whitecap and Azura, this small clearing recently caught the eye of a nesting icewyrm. Defeat Karaul Silverwing in under 7:00 / 5:00 / 3:00. Karaul Silverwing is flying a lot. Her landing breaks are only 20 seconds long, so using these to deal damage is very important. She always flies in straight lines and always flies so that she crosses one of her egg nests. She switches directions between 3 to 6 times before she lands again. While flying, she only attacks when the players come in front of her. She does not launch her attacks when not passing over a hero. Look at the minimap and just stay out of the direction she is flying to avoid the attacks. While she is flying, destroy as many eggs as possible. Although she lies new eggs when landing, she first makes other eggs hatch, so she cannot make her new eggs hatch immediately. This new eggs can then be quickly destroyed on her next flight. Upon landing, she forces some eggs to hatch. The amount of eggs depend on her health: 3 eggs when above 66%, 4 when between 33% and 66%, and 5 when below 33%. Each egg spawns 3 Silverwing Cutchlings. These cannot be de-aggroed, but are fairly easy to kill with AoE nukes, since they have no magic resistance. While on the ground, she uses Projectile Curse on a random hero. It's essentially Winter's Curse without the damage immunity. Therefore, same rules as playing against Winter Wyvern apply: Stand apart from each other to avoid the taunt. The only way for the primary target to avoid the spell is to be invulnerable upon impact. The effect pierces everything else. Her other ground attack is a very slow moving projectile which applies the same effects as her flight attack when hitting. Melee heroes should be stay back a bit until the attack is launched. It difficult to dodge when in melee range. Well within the safe haven of Azura's patrols, this powder pathway is a downhill dream. Right click a Blueheart Racer (penguin) to ride it and then race to the next area. The penguins will give a small amount of gold when they collide with another object, and you will no longer be able to ride that penguin. The further you ride the penguin, the more gold it drops. Resettled by a group of colonists out of Cobalt after a long abandonment, Azura is a village still very much threatened by the encroaching wilds. Home to winds capable of sheering hide from bone, few survive the trek across this blighted plateau. Find the entrance to the Frozen Crag in under 10:00 / 8:00 / 4:00. Hunt at least 4 / 6 / 8 Ice Giants. All players receive a Cold debuff in this zone. The debuff runs out in 20 seconds, after which players will be afflicted with a second debuff, Bonefrost. Bonefrost causes players to lose 60 health per second. Move to a campfire to reset the Cold debuff timer. Pocket Campfires also work, but will only last for a set amount of time. Purchase a few at the shopkeeper just before entering the zone. The basic strategy is therefore to move from campfire to campfire while killing Ice Giants and their Wild Yaks. Ice Giants shoot green projectiles that hex players (however, the players can still use their item) while resetting cold debuff timer count, as well as a spell similar to Chain Frost, but with a slightly shorter bounce range. To avoid Chain Frost it is safer to fight with Ice Giants with 2 players and rest two will stay safe. Large Relicts have a spell similar to Slardar's ultimate skill, and has a red visual indicator during its channeling time. The Corrosive Haze reduced armor significantly. Always dodge the Corrosive Haze. It is the main reason of death when the mob arrives. Though some folk in Azura long to journey to their ancient mountaintop home, those who try to pass through the crag are seldom seen again. Defeat Storegga in under 8:00 / 6:00 / 4:00. Storegga throws boulders, and creates obstacles on the map with each throw. Phase Boots can be used to phase through the stones, Glimmer Cape also works. Storegga will pick up players who stand too close to him and throw them away, stunning allies in the flight path. He cannot pick up a player while he is holding a boulder. Storegga has a ground punch with an AoE stun. This is easily avoidable by moving towards him or from side to side. Once Storegga drops to below half health, he will begin to channel an attack that sends out Avalanches in all directions. There is a very obvious visual indicator when Storegga is preparing to cast the Avalanche. Treant Protector's Overgrowth will cancel Storegga's Avalanches. Best way to fight this boss is to hug him at his legs, and hit him. Where once halls rang with songs and laughter, now shades beckon the long hereafter. Reach the Throne Room in under 14:00 / 10:00 / 6:00. Odobenus Frost Mages are ethereal and can only be killed with magical and pure damage. Odobenus Wraiths can be damaged by Maelstrom/Mjollnir bounces. Spreading out can help avoid too many enemies being pulled into Odobenus Wraiths' snowball, therefore decreasing the damage received. The Odobenus Ogre Seal is surrounded by several Odobenus Wraiths, try and skirt around and take out as many of these as possible before facing the seal. Destroy the Odobenus Tombstones first if your party contains squishy heroes who might be quickly overwhelmed. Use Bogdugg's Cudgel to clear the waves. Long after all other mortal thoughts have faded from memory, the revenants of the Odobenus Legion keep vigil over their ancient throne room. Escape the Throne Room in under 6:00 / 4:00 / 2:00. Phase Boots are quite useful for trying to get out of large crowds or trying to get to a dying carry. Put your tank near the door so they can run back to distract the creeps after it is opened. This will allow the rest of the team to escape. The large number of units spawned can strain some lower end graphics cards, causing lag or even crashes. Try to complete the quest as quickly as possible. to 3 star this zone, 1 hero per tile and the role's position is important, magic damage dealer needs to be on the side of the gate and 2 hitters at top and either left or right and tank can be anywhere, once the tile is at max gauge help the others, the hitter and tank need Bogdugg's Cudgel to handle their position without any problem. When compared to the crushing depths and unseen horrors lurking beneath the base of Dark Reef, there is relative safety in the shallows. Find a path through Reef's Edge in under 6:00 / 4:00 / 2:00. Shadow Blade and Ghost Scepter helps in navigating the reef. Do not shop at the start. The spawns continue while you are shopping, so just run the path as fast as possible, skipping as many fights as possible and not going for treasure chests. Go back for these after you have gotten to the next zone. In the waters around Dark Reef, even sunlit shallows are not free from the dangers of the deep. Defeat the Giant Amoeboid in under 7:00 / 4:00 / 3:00. Eul's Scepter of Divinity and Ghost Scepter are good ways to avoid the Giant Amoeboid's bouncing attack. Don't try to focus the Amoebites, use a Mjollnir or some good form of wave clear that works while attacking the main boss. The Giant Amoeboid can be pulled out of its area with a Ghost Scepter. Once its outside of its zone, the timer will stop, allowing your team to get the 3-star requirement. If you have the Amorphotic Shell, it'll be useful against the spawned Amoebites. The spawned ones from your artifact will attack the ones from the Amoeboid, and you'll have your way directly to it (You can buy the Amorphotic Shell from the market). Use any armor reduction like Assault Cuirass, Solar Crest, and Desolator to clear this wave easier, but if someone in your party has a Violet Blade (its the same of desolator but doubled its effect) can be more useful. From outward appearances, a simple undersea grotto. This protected passage into Dark Reef is known to very few. Renowned as a murderous den of the sea-bred's worst criminals, thanks to Warden Grimwater's diligence, Dark Reef operates with clockwork efficiency. Find Siltbreaker's chamber in under 10:00 / 6:00 / 4:00. Unlock at least 2 / 4 / 6 prison cells. Galvanite Gaolers send out circular waves of electricity when attacked. Keep your distance or bring spell immunity. You don't have to fight all of the Galvanite Gaolers, after you have unlocked enough cells just rush for Siltbreaker's Vault. To get the quest requirements, one person can collect all the keys, and sneak around to open all the cells before rushing to the Siltbreaker's Vault. Treant Protector's Overgrowth can disable Galvanite Gaoler circular waves of electricity. Treant Protector can utilize Blade Mail to instantly kill Galvanite Gaolers standing In the Electric waves with ultimate up. Though Warden Grimwater wanted no part in Siltbreaker's capture, nowhere else was so suited to hold him as Dark Reef. Defeat Siltbreaker in under 11:00 / 7:00 / 4:00. Siltbreaker's autoattacks places stacking debuff which reduces your armor additively and refreshes every time you get hit. Because of the armor reduction above, after 3 or 4 hits, you will take massive amount of physical damage. No combination of items will let you straigh up tank him. In addition, Siltbreaker can mindcontrol your physical damage dealers. Running away seems like the obvious thing but Siltbreaker and the mindcontrolled hero have very high movement speed so it is not the easiest thing. Better strategy to utilize items and artifacts that grant physical immunity. Items: Eul (only self), Ghost Scepter (only self) and Ethereal Blade (works on allies). Artifacts: Brine Wand (works on allies) and Glimmerdark Shield (only self). Siltbreaker has true strike so evasion is not an option. Mindcontrolled ally has true sight so invisibility is not an option. Siltbreaker has Kraken Shell, which constantly purges any debuffs placed on him. Siltbreaker sends out waves that pushes players away from him. Treant Protector's Overgrowth will cancel Siltbreaker's Waves. Siltbreaker will fire an energy beam at 75% health. This is a good time to resurrect fallen allies. At 25% health, Siltbreaker summons Swoledars that replenish his health if not killed. Regeneration is higher than damage dealt to the Siltbreaker. Therefore, players must kill Swoledar as soon as possible when spawning. Siltbreaker will shoot out an orb that disables all actions from the player while draining life. This lasts forever unless a teammate hits the player or gains spell immunity. Siltbreaker can take control of a player. If a physical damage dealer is mind controlled, he can still swap out all his damage items to the backpack to mitigate the damage. Alternatively, as described previously, you can rely on items and artifacts that grant physical immunity. Use buyback sparingly. There are many openings in which to resurrect a fallen teammate. To make this stage easier you can pick Witch Doctor, Zeus, Jakiro/Leshrac and Any Dps or Strength hero. Same with Rhyzik, Siltbreaker has very high physical resist (84%) and evasion (25%). Get a Mjollnir and MKB, then tank up if you're Physical Attacker. Positioning is really important here, and teamwork is quite need here because of his imprisonment skill that your ally needs to be attacked at least 1 time, so Leshrac, Zues, Sven, Gyrocopter, and Luna is really useful to that matter and you can focus on Siltbreaker with no problem. Siltbreaker's Torrents can be avoided by being invisible. The key to beating Siltbreaker is having sufficient AoE damage to clear the summons, single target damage for Siltbraker himself and sufficient movement speed for dodging spells and reaching the healer summons quickly. Without movement speed skill/items, you will have problems killing the healers in time. One big mistake is picking someone like Treant Protector and not building any source of damage. Unless the other 3 heroes have end game artifacts, you cannot afford to have a fourth member doing little damage. With MKB, Mjollnir and Daedulus on four heroes, you should have enough damage (mostly magical from the procs) to damage Siltbreaker before he gets healed too much during the final phase. Utilizing Blade Mail on Treant Protector against wave and laser phases deals immense amounts of damage.As Treant's ultimate Is essentially a 2nd life It Is extremely safe to do so. Players obtain one respawn charge every time a checkpoint is passed, up to 5 charges. Players can respawn one another by clicking on a fallen player's tombstone. This will consume a respawn charge. Players can buy back, and respawn at the last checkpoint. This will consume two respawn charges. A Life Rune can be picked up to gain an additional respawn charge. A limited selection of heroes are available for this campaign. Click on a hero's icon to see their custom stats and abilities for this event. Siltbreaker uses the default Dota 2 items, with a few tweaks. A couple of items are completely disabled, while a very few received modifications. Most buyable items can be found as drop-items after killing enemies or breaking environmental objects and opening chests. They can also be purchased at various shops scattered across the campaign. Most items can be sold at shops. Dropped items last for 30 seconds on the ground before they despawn. This excludes quest items, Life Runes and Artifacts. Items are fully sharable with allies (including NPCs). Click on an item's name to view full mechanics information. These items cannot be purchased, but are dropped from enemies, except for the quest item. Gold Bag Grants a set amount of gold to all players. Health Potion Restores 20% health to all players. Mana Potion Restores 20% mana to all players. Life Rune Grants an additional life to the player that picked it up. Artifact Coin Used to purchase Artifacts. Greater Salve Activate to recover health. Greater Clarity Activate to recover mana. Book of Strength Permanently grants +3 strength to the user. Book of Agility Permanently grants +3 agility to the user. Book of Intelligence Permanently grants +3 intelligence to the user. Pocket Campfire Creates a campfire to ward off debuffs in Iceblight Plateau. Also regenerates health and mana. One Secretive Shopkeeper is hidden on the map. He sells Gallaron's Gamble for 750 gold, which contain a random item, a trap, or an Artifact. a dark tunnel. Move to the left through the tunnel and then upwards to find the shopkeeper. Reduced cleave damage from 40% to 20%. Reduced health regeneration from 7% to 1%. Not listed in any shop, but can still be bought by searching its name in the shop. Artifacts can be used to provide various benefits in the campaign. Artifacts are obtained in the armory as a cosmetic item by random drop in game. These items can then be equipped in-game via the artifacts tab next to the shop tab. Owned Artifacts have to be bought with Artifact coins in-game. Artifact coins are acquired as random drops from enemies. Artifacts appear as golden treasure boxes when dropped on the ground. Artifacts are assigned and bound to a player upon dropping, and cannot be shared. Artifacts are permanent and can be used across multiple games. Artifacts from Act II can be used in Act I, and vice versa. Players must be above a certain level for artifacts to function. Click on an artifact's name to see more detailed mechanics and information. Active: Ogre Seal Flop - Lua error in Module:Show at line 64: attempt to index field '?' (a nil value). Passive: Rough Bearskin - Lua error in Module:Show at line 64: attempt to index field '?' (a nil value). Passive: Winter's Embrace - Lua error in Module:Show at line 64: attempt to index field '?' (a nil value). Passive: Freeze - Lua error in Module:Show at line 64: attempt to index field '?' (a nil value). Passive: Resist Death - Lua error in Module:Show at line 64: attempt to index field '?' (a nil value). Passive: Ambient Sorcery - Lua error in Module:Show at line 64: attempt to index field '?' (a nil value). Passive: Damage Block - Blocks damage from all sources and types. Passive: Craggy Coat - Lua error in Module:Show at line 64: attempt to index field '?' (a nil value). Passive: Stonework Pendant - Lua error in Module:Show at line 64: attempt to index field '?' (a nil value). Active: Health Pact - Lua error in Module:Show at line 64: attempt to index field '?' (a nil value). Passive: Division - Lua error in Module:Show at line 64: attempt to index field '?' (a nil value). Passive: Devastation - Lua error in Module:Show at line 64: attempt to index field '?' (a nil value). Active: Aqueous Rush - Lua error in Module:Show at line 64: attempt to index field '?' (a nil value). Active: Brinefoam - Lua error in Module:Show at line 64: attempt to index field '?' (a nil value). Active: Gleam - Lua error in Module:Show at line 64: attempt to index field '?' (a nil value). Passive: Critical Strike - Lua error in Module:Show at line 64: attempt to index field '?' (a nil value). * Lifestone, Amorphotic Shell and Violet Blade are the only artifacts which are fully tradeable and marketable. Players with Battle Pass level 165 or higher will receive two Siltbreaker Rewards for every zone they complete with 3 stars. Claiming the Level 165 Bonus Siltbreaker Treasures reward will retroactively grant bonus treasures for any zones that had been previously 3 starred. Like normal matches, players can receive drops after each game. Players who complete the campaign will earn a special emoticon.